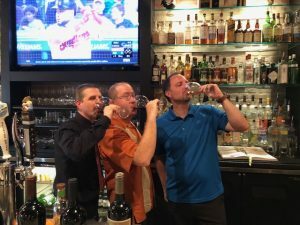 As our listeners know, we’ll be hosting a culinary and cocktail cruise of a lifetime in October of 2019, and this week’s show was the first of a two-part series to prepare your palates for the trip! On this broadcast we covered the regional Italy and Malta experiences that we’ve planned, and we came to you live from one our favorite destinations for Italian cocktails, wine, and cuisine…Caffe Torino! Our celebrity co-host was the president of Bon Voyage Travel, Ryan Hansen, who talked about a few of the ports and excursions that we’ll enjoy, with an emphasis on food and beverage. We then welcomed Scotty Horn of Celebrity Cruises who revealed the latest on his brand new ship that we’ll all be on together, The Edge! He had us at martini glass-shaped hot tubs! Malta Joe from Malta Joe’s Baked Goods also joined the conversation with an update on his Pastizzi portfolio and some of his favorite things about Malta. We then turned to Italy’s regional expressions of wine and food with Caffe Torino sommelier Derek Malone! 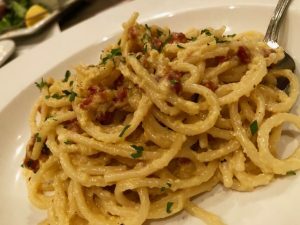 A tasting of Caffe Torino’s Pasta Carbonara – and the secret to the sauce is egg white and parmesan…no heavy cream! He showcased some of dishes and wines that he thought best represented the adventures that await us next fall. And his Pasta Amatriciana and Carbonara were crowd favorites!